SHIPPENVILLE, Pa. – Looking for a romantic getaway for a long weekend, honeymoon, or proposal? Get off the beaten path and discover some of Pennsylvania’s best-kept (and most romantic) secret spots! We’ve outlined five romantic hidden gems to add to your list of places to go! A favorite romantic spot in fall or spring, Kinzua Sky Walk preserves one of the longest and highest railroad bridges. Walk out over an old railroad trestle more than 2,000 feet in the air (don’t worry, there’s a fence!). Come to a viewpoint with a glass-bottomed enclosure where you can glimpse the railroad trestles beneath you. The walk is magical in fall, when the leaves are aglow. A trip to Kinzua Sky Walk puts you between the Allegheny National Forest and New York’s Allegany State Park. This is the perfect spot for an active, yet romantic weekend — or maybe a surprise proposal! Nothing says romance quite like wine! 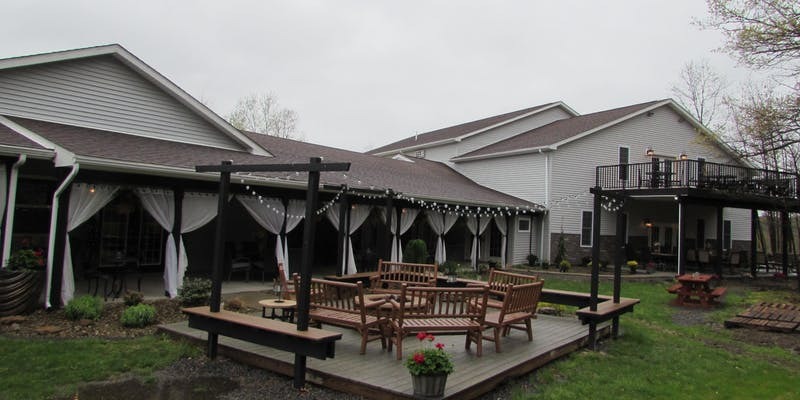 Whether you are celebrating a special day or planning a PA winery honeymoon, a stay at The Inn at Deer Creek Winery delivers all of the amenities you want for romance. Honeymooners love the Brooks Deluxe room, which has a fireplace, hot tub, and plush king bed, but there are eight unique themed rooms to choose from. Not only do you get breakfast every morning, but you will also get a complimentary bottle of wine with your stay. Savor the wine made on site while relaxing in the hot tub with your partner. The Shippenville area offers museums, outdoor recreation, and shopping to help you make the most of your romantic time away. The Allentown Rose Gardens are a locals’ favorite place for prom photos, engagement shoots, and romantic picnics for young lovers. You’ll get peak rose bloom (and that unbeatable smell) in the summer, but the gardens and ponds are truly lovely any time of year. Imagine sitting in a grotto surrounded by mosaics, plants, and whimsical objects d’art. Philly’s Magic Gardens is unusual, romantic (especially at sunset!) and the perfect Instagram backdrop for your love story. You can even get married amidst the grottos, tunnels, and indoor and outdoor sculptures at this one of a kind art park in downtown Philly. Bushkill Falls has eight distinct waterfalls, but Bridal Veil Falls steals all the thunder with that name. All the soft and romantic images it conjures up ring true when you are standing beside the gentle falls, surrounded by lush mosses and ferns. Have a proposal or photo shoot at the falls, or include the park on your next vacation. You can walk between the falls, serenaded by birdsong and tumbling water, enjoying one of the most romantic spots in Pennsylvania. Plan ahead if you’re hoping to secure the perfect photo shoot or proposal spot, or keep these ideas in your back pocket for the next time you need a last-minute couples’ getaway!